Regular listeners to Cladrite Radio know we’re big fans of Mildred Bailey. She’s perhaps not as well remembered today as some of her contemporaries, but fans of the music of the 1920s and ’30s know her well, and her versatile vocal stylings clearly proved an inspiration to songbirds who followed her, including Billie Holiday and Ella Fitzgerald. Bailey was married three times—her third husband, who proved to be a charm only professionally, was vibraphonist Red Norvo. Though their marriage didn’t last, the two recorded together from the mid-’30s through 1945. Bailey, who had health issues throughout her adult life, struggling with weight gain and diabetes, died far too young—at age 44—in 1951. Read to the end of this profile, first published in 1935, and you’ll find a couple of our favorites Mildred Bailey recordings for your consideration. We’re confident that, if you’re not already a fan, you will be after hearing these recordings.. 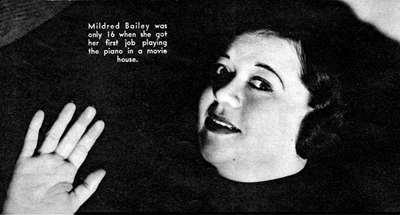 WHEN Mildred Bailey ran away from a convent and got a job playing piano in a synagogue, anyone might have guessed that this young lady would never lead a dull life. Mildred, whose real name is Rinker, is the daughter of a mother who was famous in and around Spokane for her lullabies. Her brother, Al, was a member of Paul Whiteman‘s original Rhythm Boys, the other two members of this famous trio being Harry Barris, pianist-composer, and Bing Crosby. Another brother, Miles, played saxophone in the college band at the University of Illinois and brother Charles (Chuck) Rinker played the guitar and sang his way through the University of California and later was vocalist with several big orchestras. He is now one of Tin-Pan Alley’s best known song pluggers. So you see, Mildred’s talent was largely a family characteristic. She first demonstrated her vocal ability and precociousness when, at the age of six, she sang a hot tune at a church benefit, much to her mother’s annoyance. Her first money job was playing piano in a motion picture theatre at the age 16. She went to work for a music shop in Spokane, playing the piano and singing over songs for prospective purchasers of sheet music and when she went to Seattle to visit an aunt, she looked for something similar to do there. She found it, behind the music counter of a five and ten cent store, demonstrating popular songs. While working there a night club operator from Vancouver, British Columbia, came along, heard her singing and playing and offered her a professional engagement before an audience as an entertainer. “So you see,” she explains, “it is largely a matter of getting the breaks. If that night club owner hadn’t come along I might still be hanging a piano and singing my head off for 25 center a copy for the store and an altogether too small salary to keep myself in perfume and jewelry, my two greatest extravagance. Before long, “Rink,” as Mildred has been nicknamed by her friends, went to Los Angeles and joined a Fanchon and Marco stage unit show. These units of entertainment appeared in principal theatres on the West Coast and, in recent years, have travelled throughout the nation. After a number of tours for Fanchon and Marco she began making short featurettes for Vitaphone and thus realized a childhood ambition to become a movie actress. Now it must be mentioned that in those early days of her professional stage and movie career, she was a petite little thing, weighing only about 100 pounds, for all of her five feet and four inches of height. Perhaps this will sound strange to you who only know her as a radio star as she is today—a fat, jolly singer of spirituals and hot rhythm songs weighing around 190 pounds. But first let us tell you that it was Paul Whiteman who discovered Mildred Bailey when he went to Los Angeles to make his first movie, “The King of Jazz,” for Universal Pictures. Her unique singing style matched the rhythm of Whiteman’s music and he engaged her to sing with his band as the featured feminine vocalist. Cautiously feeling her way back to the top of the singing profession, Mildred devoted nearly all her efforts to radio and concentrated on building up millions of unseen followers in every city and town in the land. Soon theatres were demanding her for personal appearances. Her first one after her come-back was a nightmare in anticipation, for she wondered how audiences would react to the “new” Mildred Bailey. She need not have had any fear of her welcome, though, for her followers hadn’t forgotten her, her voice was actually much better than it had ever been (possibly even due in large measure to the new “feeling” which she could express as a result of her suffering) and, anyway, what are a few pounds more or less between friends? Mildred has never written poetry or music and has never been in an airplane. She wants to appear in musical comedy some day and loves spaghetti, driving, fishing and the telling of fish stories. She is happily married and rehearses in a home that would probably seem like a madhouse so many of you. She is only happy when both radios and the phonograph are going full blast and she is busy rehearsing songs for a forthcoming broadcast, all at one and the same time. She likes company and lots of it and enjoys singing over the air before a studio audience. She lives in the country.